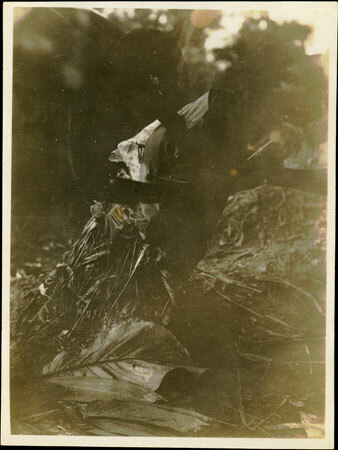 A dark image of two people collecting termites from a termite-trap of leaves set on a mound. Termites were commonly gathered for oil by people within a territory surrounding the homestead, with rights to gather in certain areas agreed between neighbours. Note on print reverse ms pencil - "31/1"
Morton, Chris. "Zande termite gathering" Southern Sudan Project (in development). 03 Jan. 2006. Pitt Rivers Museum. <http://southernsudan.prm.ox.ac.uk/details/1998.353.9/>.